While car security systems are becoming more sophisticated so too are car thieves, who are using high-tech gadgets to unlock and start vehicles without a scratch. Electronic hacking equipment, originally intended for locksmiths to gain access to vehicles, are being used by cunning car thieves to steal vehicles that use a keyless entry system. The devices, which can be bought online from overseas websites, intercept the signals from key fobs to obtain a code which thieves use to gain access to your car, it’s that simple! Without causing any damage or disturbance your most prized possession could be driven away in a matter of minutes! 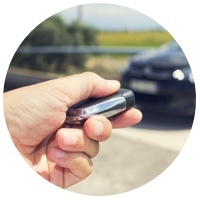 If your vehicle is controlled using keyless entry software then you could be at risk. Car thieves are targeting all kinds of vehicles from luxury sports cars to vans. Parking your vehicle in a well lit area, ensuring all doors are locked and keeping all valuables out of view are obvious ways to deter lurking thieves, but a vehicle tracking device is equally, if not more effective. For more information on which car tracker would be best for your vehicle call our expert customer care team on 0800 756 5100 or head over to our Nationwide Installation page to find your local helpline.